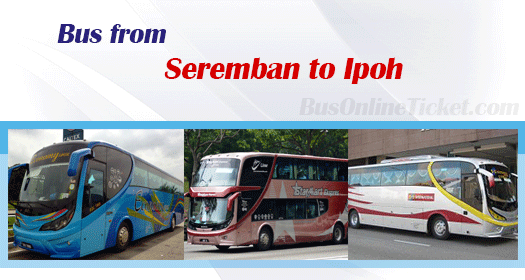 Bus from Seremban to Ipoh is the most convenient service to travel from Seremban to Ipoh. By taking direct bus from Seremban to Ipoh, travellers do not need to transfer bus from Kuala Lumpur to Ipoh anymore. Therefore, direct bus service from Seremban to Ipoh remains the most favourite mode of transport to travel between the two places. Kesatuan Express, KPB Express, Economy Express, Starmart Express, Jasmine Express and S&S International Express are few bus operators supplying bus from Seremban to Ipoh. Kesatuan Express is the main player in this bus route by providing 4 daily departures. KPB Express, Economy Express and Jasmine Express are managed under an agent in Seremban called KPB Seremban. All operators are deploying single deck VIP coach to operate the bus service. VIP coach type is equipped with spacious seating and big leg room to ensure comfortable journey for passengers. Duration required to travel from Seremban to Ipoh via bus is about 4 hours. Washroom break will be given during the journey. Additional break will be given upon request from the bus driver. The bus ticket from Seremban to Ipoh is cost a range of RM 20.70 to RM 35.00 depending on your selection of bus operators. For bus from Seremban to Ipoh, passengers will board the bus at Seremban Bus Terminal 1 and alight at Aman Jaya Bus Terminal. From Aman Jaya Bus Terminal, passengers could take public bus or taxi to Ipoh town. Booking your bus ticket from Seremban to Ipoh online in advance could avoid disappointment for not getting a ticket. Everyone now can purchase bus ticket at our official website BusOnlineTicket.com or BOT mobile app which can be downloaded for free. It is very easy, secure and convenient!